Improve your golf swing anytime, anywhere with ease! Tired of using heavy equipment? Easily analyze your swing using your iPhone. 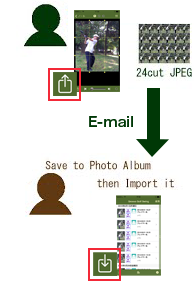 You can share and import 24cut JPEG between Groove Golf Swing for iPhone and Groove Golf Swing for Android each other. Groove Golf Swing for Android will save the recorded images to the SD card in your Android smart phone. Ask a friend to record your golf swing. Go to Recording view (Not Recording yet). Start by pressing the "Start Recording (Quiet Please)" button (Recording Started). Analysis will be done on last 3-4 seconds (24 frames technically!) before the "Stop Recording" button is pressed when the swing is over (Start Saving Photos for last 3-4 seconds). Then freezeframe will be created soon. Line up the horizontal and vertical lines with the subject of the photo by dragging the edge of the line. Next, line up the angle of your body and set the support lines same as guide lines. You can set up to 3 support lines: either for your body or your swing. You can see any movement changes in your stance and the movement of your head, shoulders and knees. You can watch your recorded swing including the guide and support lines by dragging slider control. * The 24 frame images can be combined into a single JPEG file and saved on your iPhone Photo Albums so you can share it with your friends. You can import swing photos from Photo Library. When your firends recorded your swing photo, please ask them to send 24 cut JPEG by e-mail and save it to your Photo Library in your iPhone. Then you can import it by tapping Import icon on the top list view. You can import 24cut JPEG in the Photo Library to your Groove Golf Swing. By this function, you and your friends will share swing photos each other. Record your swing at golf practice range by yourself. Frame by frame control is added in addition to slider control to see your swing pictures. E-mail 24cut JPEG file from this app directly, the resolution of the image is higher than the one e-mailed from photo albums.